I recently reported the 86% differential between the cheapest and most expensive quotes that we received for a particular client situation. This difference was based on a comparison of the anticipated charges that might be levied by different invoice discounting companies. I thought it might be interesting to look in a bit more depth at the components of those costings, and how they vary between the different invoice discounting companies that quoted. The two basic components of the overall cost in our example were administration/service charge (a percentage of turnover) and discount charge (similar to interest). The service charge (as it is commonly called - although Administration Charge is a far better term for invoice discounting) is the percentage of the value of turnover that is charged for providing the facility. In the case of invoice discounting there is of course no credit control service, but the charge is for the administration of operating the facility. In this particular case, we saw a variation between the cheapest and most expensive quotes of 150%. That means that if you choose a provider at the bottom of the pricing table, you would pay 1.5 times more than the cheapest provider would charge, for exactly the same facility - a huge difference in fees. The discount charge works in a similar way to interest on a loan. It is a percentage of the funds in use (charged in addition to either bank base rate or LIBOR). So if a company borrows say £100,000 at a discount margin or say 2.5% over base rate of say 0.75%, they will pay 3.25% (2.5 + 0.75) each year for those funds. Which would be £3,250 for the year in my 100K funds in use example. LIBOR can be a slightly different value to base rate, and both can move. We found that approximately 15% of the providers charged their discount margin over LIBOR, whereas the remainder used bank base rate. The discount margins quoted (excluding base or LIBOR) varied by 74% between the cheapest and most expensive quotes. Again a substantial difference, albeit less that the range for service charge. This means that you could pay 74% more discount margin to the most expensive provider, than to the cheapest. 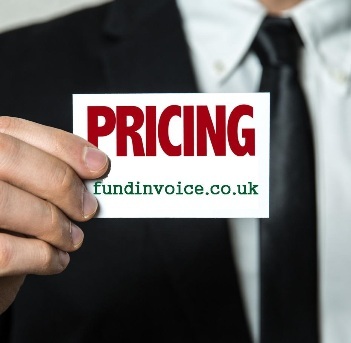 Whilst there was a cheapest invoice discounting company that led the overall pricing table, it is worth noting that no single provider came out cheapest in respect of all aspects i.e. service charge, discount and overall projected cost. This means that your choice of provider could be influenced by the exact nature of your business and the amount of funding you expect to draw down. For example, if you don't expect to need the full amount of funding, the overall costing might be less sensitive to discount margin, than to service charge. This could affect who would be the cheapest provider in your case.